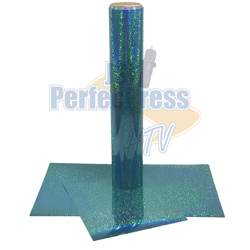 Take your logo to the next level with Holographic HTV. Create a three dimensional prism-like effect to make your textiles shine. Great for making rhinestone designs on garments. Easier than using rhinestones. Create and cut your rhinestinestone design, weed and transfer to garment. Since this material is a hard foil and not of pu composition, it is not recommended to have images over .75 inches thick. Material cuts greater than than .75 inches will wrinkle after washing, so hand washing is recommended in that case. Soft and gentle hand washing is recommend. Detergent can be used soaking before washing and can be used during hand washing. Water temperature should be less than 100 F.
All Perfecpress/Perfecprint brand products are CISPA ceritfied. PLEASE NOTE: The Spectrum HG Foil has lines in it from the manufacturer that will stay in the design when pressed. 2/28/2019 – Do you need the transfer paper to apply the foil to your shirt. Response From JSISigns: No. This goes directly on the fabric like regular heat transfer. The liner is used as stability as you transfer. You cut in reverse on the glue side, weed out the background, place on fabric, and heat press. From Jenny luttermoser of Ann Arbor , Michigan on 2/25/2019 . I love this company as far as quality and prices and I love this product in particular !! I’m actually wearing an awesome shirt I made with it right now! It was extremely easy to weed and it looks absolutely amazing! I did some really detailed images too! I’ve already reordered! Beautiful, but a bear to weed!! From Anonymous of Oregon, Oregon on 1/11/2019 . As with all products from JSI signs, it is fabulous. I did find however that in order to completely kiss cut the film, you must use a much deeper blade setting than normal. If you’re cutting on a craft cutter you’re going to be at at 10 with at least one or two additional passes. On a commercial unit, at least at a 35 or 40 for death. Of course if you’re using a new were blade It is just speculation. When it’s cut and weeded the material is easy to work with and presses out beautifully!!! From Rachel Lane of Trenton, Texas on 8/1/2018 . This is a great HTV and was relatively easy to weed and use on a heat press. And shipping was quick. Will order from JSI again.